President Trump in particular has criticized FDA for a slow and burdensome approval process. FDA offers four options to speed up approval and they can be used in combination. But just which of the many combinations offers the fastest approval? Leela Barham takes a look at the combinations used for novel drugs approved in the last three years, in another in a series of features exploring FDA expedited approvals. Between 2015 and 2017, seven combinations of FDA's expedited development and review methods were used, and a further two expedited development and review methods were used by themselves. 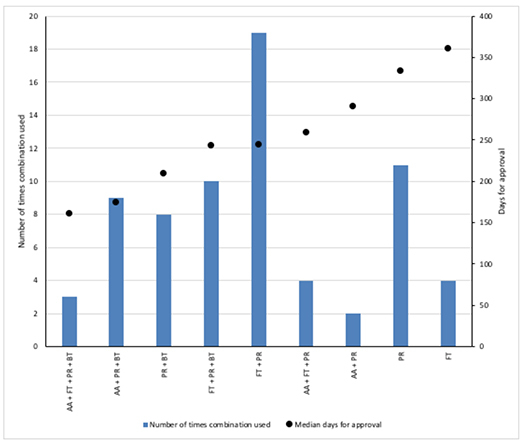 Pooling across 2015 to 2017 reveals it was the combination of all four expedited development and review methods that gave the fastest median approval time of 161 days. That option is rare though; only on three occasions was a novel drug approved using all four options (Figure 1). 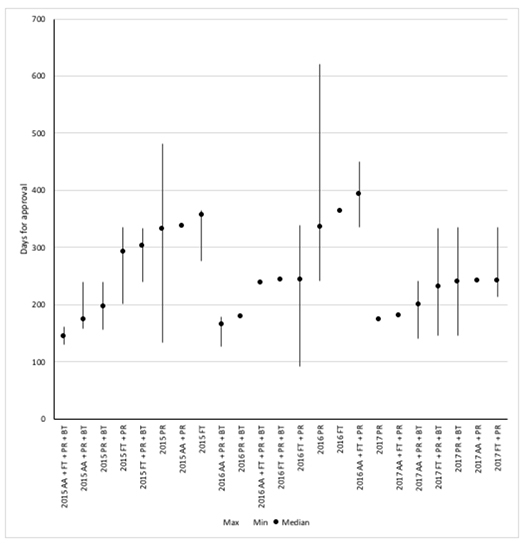 That also means that the fastest median approval time was only just behind the median time of 145 days for 2013 and 2015 when all four options are used, and 5 days faster than the median approval time of of the second fastest of using Priority Review, Breakthrough Therapy and Accelerated Approval. Perhaps as you’d expect, the slowest median approval time is when only one expedited option is used: Fast Track alone had the longest median approval time of 361 days. Source: Analysis of FDA novel drug approvals data 2015, 2016 and 2017 and dates taken from FDA approval letters. Note excludes an extreme outlier in 2015. Whilst pooling data across three years suggests that it’s fastest when all four expedited development and review methods are used, that’s not always the case. In 2016 it was the combination of Accelerated Approval, Priority Review and Breakthrough Therapy designation that came in as the fastest (Figure 2). In 2017, it was just having Priority Review that was the fastest. There’s plenty of variation within each combination too, particularly when Priority Review is used. Can approvals get any faster? While using expedited development and review methods have been speeding up approvals, it’s the combination of all four that can achieve the fastest approval times. Using all four is only slightly slower now than it was just a few years ago and that’s by just a margin of less than a month. Whilst that doesn’t mean that technically under Trump’s Presidency, which began in 2016, the FDA hasn’t sped up approvals using the tools already available, the FDA dose seem to be holding it’s own in terms of speed. Will Trump be able to get the FDA to do even better? And would that be wise?